2. Peter Wood. 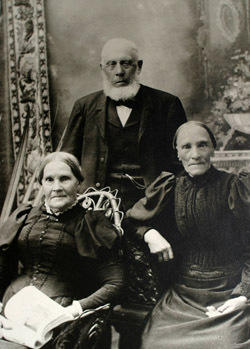 Son of Peter Wood & Janet "Jessie" Cleghorn. Born 13 Jul 1829 in Roxburghshire, Scotland. Christen 13 Sep 1829 in Eckford, Roxburghshire. Died 15 Oct 1897 in Harvey. Buried in Harvey Settlement Cemetery. Occupation Farmer and Land Surveyor. 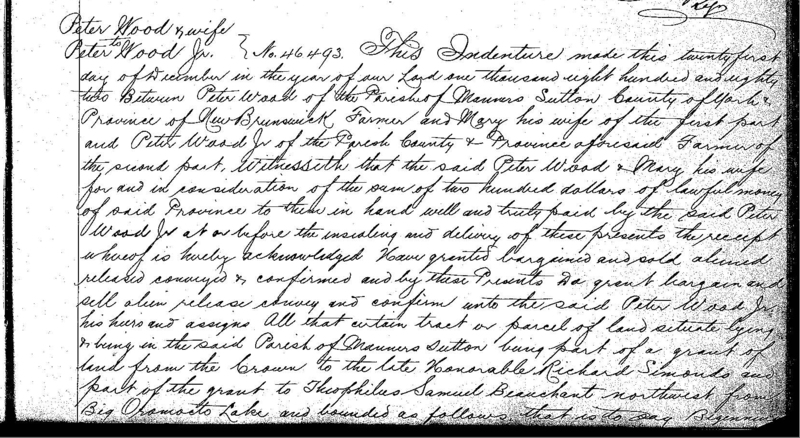 From parochial registers of Eckford in Roxburghshire (Researched by Bruce Elliott, 2004): "Peter Wood Mason in Kirk Cottage & Janet Cleghorn Waterfoot both unmarried persons their child born the 13th July 1829 & Baptized the 13th of Septr 1829 named Peter." 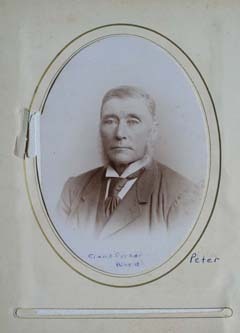 Peter died 15 Oct 1897, age 68 yrs. 2 mo. 15 days. 4279. Undated tin-type image of five men. 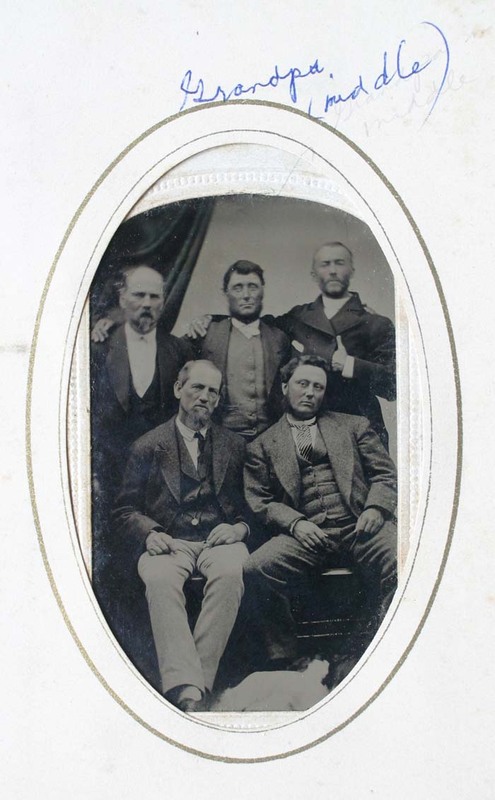 The only identified one is "Grandpa" in the middle back row.Grandpa is Peter Wood, son of Peter Wood & Janet "Jessie" Cleghorn (b 13 Jul 1829 in Roxburghshire, Scotland. d 15 Oct 1897, Harvey). 4250. Undated cabinet card of Peter Wood, son of Peter Wood & Janet "Jessie" Cleghorn (b 13 Jul 1829 in Roxburghshire, Scotland. d 15 Oct 1897, Harvey). 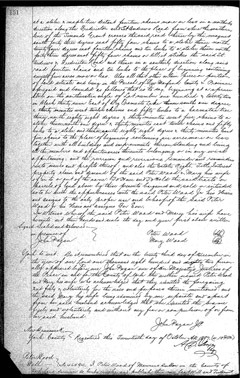 The 1851 Census indicate that Peter Wood, age 22, Scotch, Labourer; Mary, his wife, age 22, Scotch, and son Peter age 1 year, Scotch, came to New Brunswick in 1851. In the 1861 Census, Peter was a farmer and land surveyor. At that time they had five children. Religion: Presbyterian. 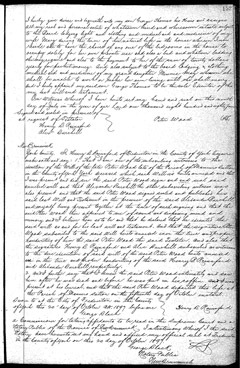 They owned or occupied 20 acres improved and 80 acres unimproved land; cash value of farm, 50 pounds, value of implements and machinery, 5 pounds. They had one horse, one milch cow, one other neat cattle, 4 sheep; produced 57 lb. butter, 12 lb. wool, 4 tons hay, 20 bu. oats, 20 bu. buckwheat and 50 bu. potatoes. He married Mary Moffitt, daughter of John Moffat & Janet Gladstone, 9 Mar 1849 in By Rev. T. J. Yair, Roxburgh, Eckford, Scot. Born 27 Jul 1829 in Stichel, Roxburgh, Scotland. Died 19 May 1904 in Harvey. Buried in Harvey Settlement Cemetery. Undated photograph of John Swan (b. 1822, Northumberland; d.10 Mar 1910, Tweedside), his wife Margaret Moffitt (with book; b. 1821, Roxburgh, Scotland, d. 4 Sep 1909; and her sister Mary Moffitt (b. 27 Jul 1829, Stichel, Roxburgh, Scotland, d. 19 May, 1904, Harvey Station. 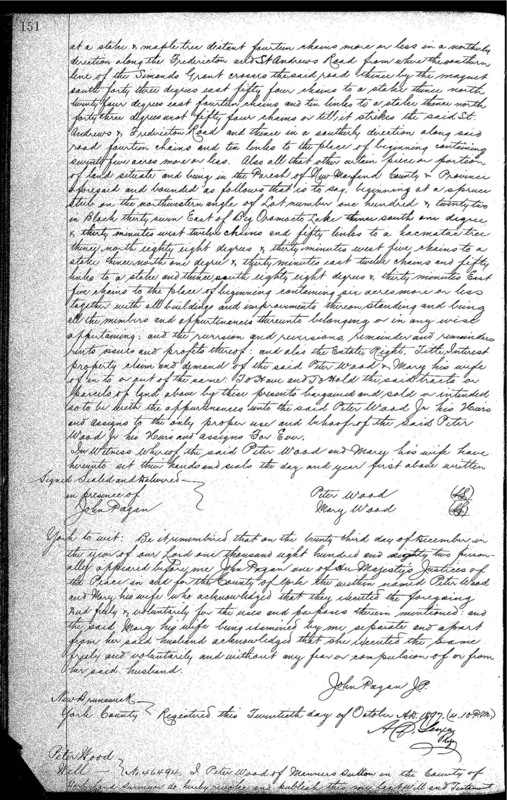 She married Peter Wood (b. 13 Jul 1829, Scotland; d. 15 Oct 1897). 4305. 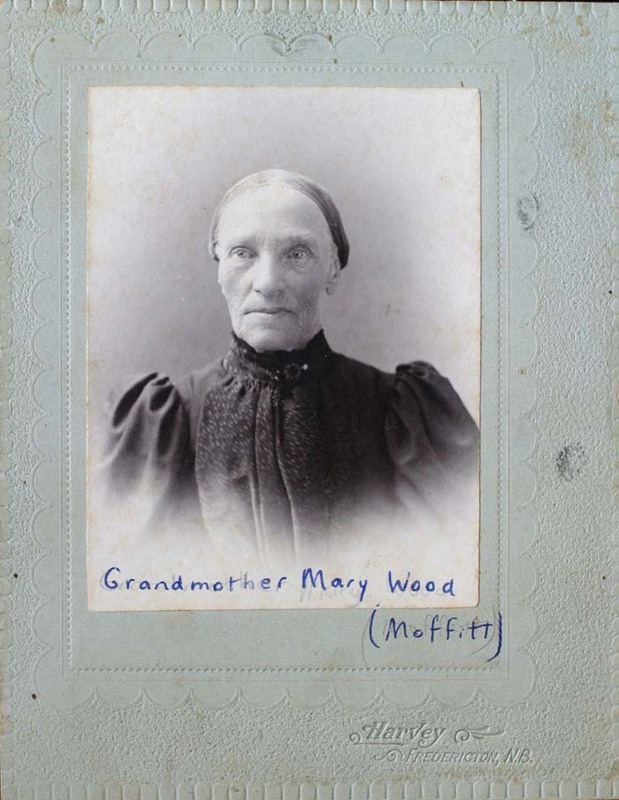 Mary Moffitt (b. 27 Jul 1829, Stichel, Roxburgh, Scotland, d. 19 May, 1904, Harvey). She married Peter Wood (b. 13 Jul 1829, Scotland; d. 15 Oct 1897). Surname has various spellings, Moffat, Moffit and Moffitt. Some of the older records has Moffat. More recent spelling is Moffitt. Mary died 19 May 1904, age 74 yrs. 9 mo. 24 days. 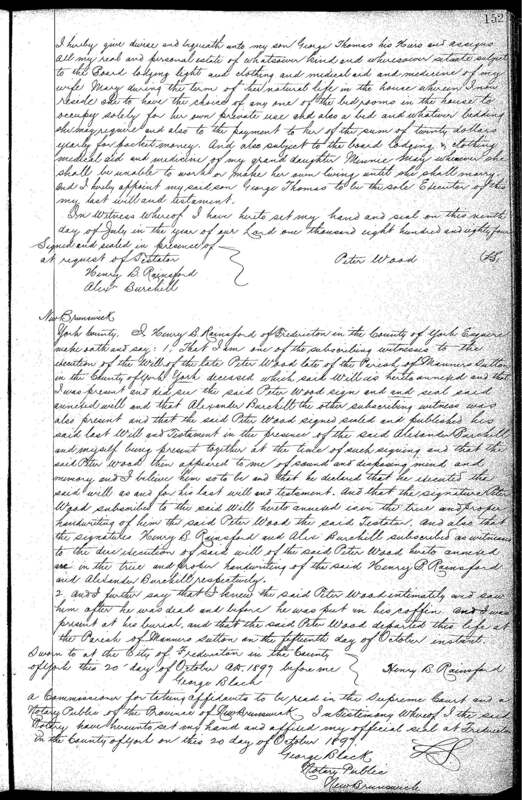 Last will and testament of Peter Wood, son of Peter Wood & Janet "Jessie" Cleghorn (b 13 Jul 1829 in Roxburghshire, Scotland. d 15 Oct 1897, Harvey).